New Lit Salon Press, 9780988551299, 132pp. For generations, the science fiction genre and literary fiction have been perceived as irreconcilable. Startling Sci-Fi: New Tales of the Beyond attempts to prove otherwise. These 13 stories are boldly literary while employing unmistakable characteristics of the sci-fi genre. Jhon Sanchez's "The Japanese Rice Cooker" and Daniel Gooding's "Crow Magnum Xix" toy with readers' expectations by defying traditional storytelling techniques while Eve Fisher's "Embraced" and David W. Landrum's "The Priestesses of Light" are intricately constructed character studies. Rob Hartzell's "The Dead and Eternal" raises profound concerns about modern technology though Adam Sass's "98% Graves" takes an optimistic view of the future. Every story is accompanied by Stefanie Masciandaro's vibrant, hypnotic illustrations which simultaneously evoke the days of sci-fi pulp paperbacks yet remain firmly grounded in 21st century digital techniques. 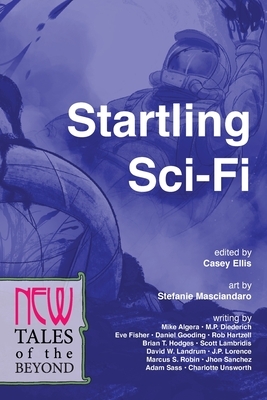 This anthology will take you beyond what you thought possible in science fiction.